GELSENKIRCHEN, Germany (AP) — Finally, the year is over for Germany. The 2014 World Cup champions, who failed to even make it out of the group stage at this year’s tournament in Russia, ended their disappointing campaign with a thud, conceding two late goals in a 2-2 draw with the Netherlands. Even before the match started, Germany had already been relegated from the top tier in the UEFA Nations League. Germany started the year hoping to defend its World Cup title. But early losses to Mexico and South Korea sent the four-time champions home ahead of schedule. Mesut Ozil then quit the national team soon after, citing “racism and disrespect” from German society because of his Turkish roots. Few coaches could survive a year like that, but Joachim Loew is no ordinary coach. Loew been in charge since 2006 and has shaped the careers of players like Thomas Mueller, who made his 100th appearance on Monday — all of them under Loew. 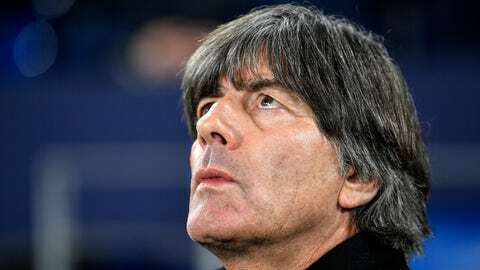 He was also fortunate to sign a four-year contract extension in May, a month before the World Cup debacle, and his focus is on the 2020 European Championship despite a “Loew out” banner in the stands on Monday. Loew has called 2018 “a slap in the face,” but said Germany will soon see the benefits of a post-World Cup rebuild. Key to that, he said, will be Leroy Sane, a player left out of the World Cup team despite being named Premier League young player of the year. There’s no doubt that Germany has depth after winning the 2017 Confederations Cup and European under-21 championship in the same week. The problem so far has been refining that pool of players into a coherent team. At times on Monday, Germany looked like its old self, with the forward trio of Werner, Sane and Serge Gnabry combining for both goals. However, Loew used all three of his substitutions to replace them with Mueller, Marco Reus and Leon Goretzka. Without any fresh legs at the back, the defense failed to mark Dutch scorers Quincy Promes and Virgil van Dijk. Loew said he still hasn’t found his preferred lineup.